Jean Michel Schlumberger (1907-1987) was one of the leading jewellery designers of the 20th century. Born in 1907 in Mulhouse in eastern France — in an enclave of Alsace that was then part of Germany — Schlumberger was sent to Berlin by his parents to pursue a career in banking. He rebelled and moved to Paris, where he was given his break by the Italian fashion designer Elsa Schiaparelli, who had come across his home-made flower brooches made from Meissen porcelain. He began to design fanciful buttons for Schiaparelli, then later, costume jewellery. The bracelet shown below, which Christie’s sold for $161,000 in 2016, is an early example of Schlumberger’s work. After the Second World War — having served in the French Army and survived the Battle of Dunkirk — he moved to New York. He worked briefly as a fashion designer before opening his own jewellery salon with his business partner, Nicolas Bongard (1908-2000). Schlumberger’s designs soon caught the attention of Walter Hoving, the chairman of Tiffany & Co. In 1956 Hoving offered Schlumberger a job at Tiffany, where he would go on to build a client list that included Greta Garbo, Princess Marina of Greece and Denmark, Wallis Simpson, Elizabeth Taylor and Audrey Hepburn, among others. Schlumberger was given his own workshop and salon on Tiffany & Co.’s mezzanine floor — accessed via his own private elevator. ‘His jewels would have been among the most expensive pieces in the shop,’ says Chen. Schlumberger was eventually promoted to vice president of the company. ‘It’s very complicated,’ the jewellery designer once said to a reporter. ‘I make jewels, but I hate modern jewellery — and I can’t tell people I make antique jewels!’ Schlumberger’s classic designs have stood the test of time and remain hugely popular among connoisseurs and collectors. ‘I try to make everything look as if it were growing, uneven, at random, organic, in motion,’ he once explained of his design ethos. In 1957 Tiffany & Co. asked Schlumberger to set the famous Tiffany Yellow Diamond, the largest and finest yellow diamond in the world at the time, which weighed an enormous 128.51 carats. Schlumberger designed a necklace of swirling diamond ribbons to mount the stone, which has only ever been worn by three women — Mrs E. Sheldon Whitehouse; Audrey Hepburn, to promote Breakfast at Tiffany’s; and Lady Gaga, who wore it to the 2019 Oscars. In 1995 the Tiffany Yellow Diamond was remounted in one of Schlumberger’s most iconic designs — his ‘Bird on a Rock’ brooch. Initially conceived in 1965, the brooch is still produced by Tiffany & Co. with a variety of different stones, and remains a firm favourite with collectors. Another of Schlumberger’s most iconic designs is his gold, diamond, sapphire and emerald dolphin brooch. In 2001 Christie’s sold one of the dolphins from the collection of Elizabeth Taylor for $1,202,500 — more than six times its low estimate and a record for any piece of Schlumberger jewellery at auction. The brooch had been a gift to Taylor from Richard Burton on the occasion of the premiere of his film, The Night of the Iguana, in 1964, and she would be photographed wearing it on numerous subsequent occasions. ‘Fewer than 10 of these brooches have ever been made,’ explains Chen. The Magnificent Jewels auction on 16 April in New York has one of them, which was made in 2006. ‘It’s a real show-stopper,’ adds the specialist. Christie’s has also sold Schlumberger jewels from the collections of Peggy and David Rockefeller and the American socialite and philanthropist Carroll Petrie, including a necklace (below) that realised $905,000 in 2015. The collection of 150 items of Schlumberger jewellery once owned by the American philanthropist ‘Bunny’ Mellon are now on public display at the Virginia Museum of Fine Arts in America. Schlumberger remains one of only four jewellers who have signed their creations for Tiffany & Co., alongside Paloma Picasso, Elsa Peretti and Frank Gehry. 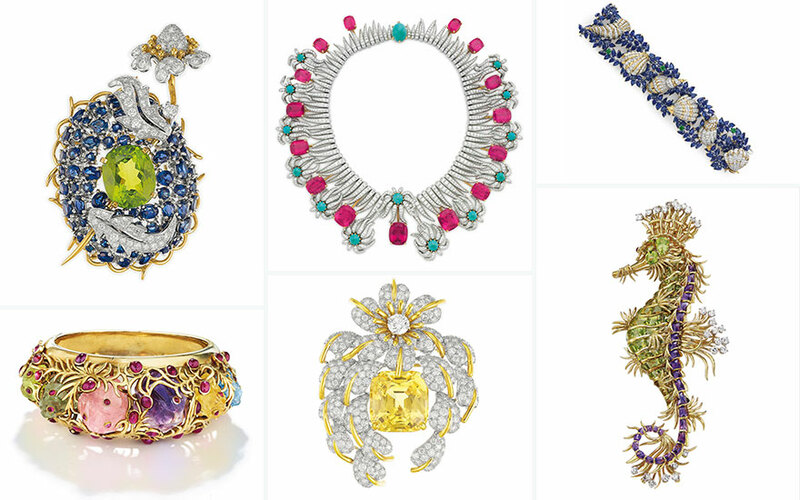 What do collectors look for in Jean Schlumberger’s jewels? Since Jean Schlumberger’s death in 1987, Tiffany & Co. has continued to produce his designs. The most in-demand pieces, says Chen, are his earlier works, which he had a hand in making. Some of the Schlumberger jewels in the Magnificent Jewels auction in New York come from the collection of the Palm Beach society figure Jean Tailer, who commissioned them from Schlumberger’s archive at Tiffany & Co.
‘Jean Schlumberger is a name that every jewellery collector should have in their collection,’ says Chen. Indeed, his work is so revered that Christie’s has even auctioned published volumes of his designs. Schlumberger’s original designs are also held by the Musée des Arts Décoratifs in Paris, which held a retrospective of his work in 1995 — only the third occasion on which a jewellery designer had been so honoured by the museum.